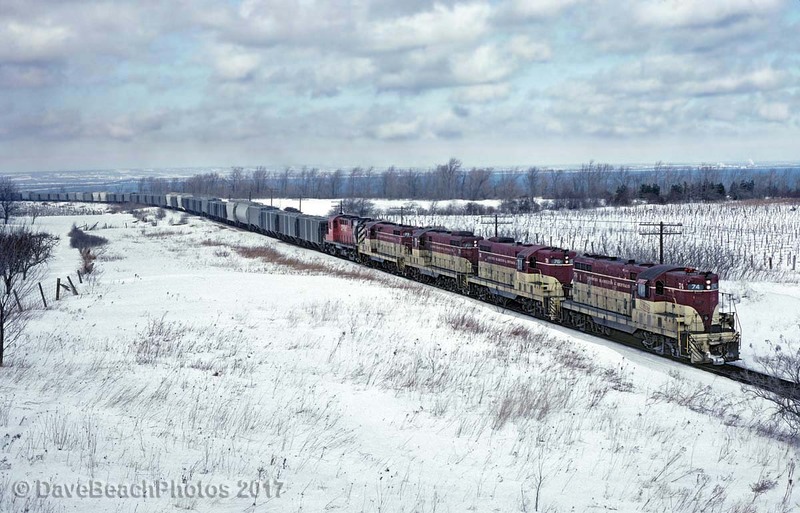 Railpictures.ca - Dave Beach Photo: 4 TH&B GP-7′s with a CP MLW tucked in behind working hard on the final leg of the climb up the Escarpment on February 28, 1982. Thanks to other posts in the database I’ve learned that this was a unit rock train for a fertilizer plant in Port Maitland. We were counting on the clear skies that were forecast when we left Cleveland in the middle of the night but we saw quite a show in spite of the mid day clouds that caught up with us here at Vinemount. | Railpictures.ca – Canadian Railway Photography – photographie ferroviaire Canadienne. Copyright Notice: This image ©Dave Beach all rights reserved. Caption: 4 TH&B GP-7's with a CP MLW tucked in behind working hard on the final leg of the climb up the Escarpment on February 28, 1982. Thanks to other posts in the database I've learned that this was a unit rock train for a fertilizer plant in Port Maitland. We were counting on the clear skies that were forecast when we left Cleveland in the middle of the night but we saw quite a show in spite of the mid day clouds that caught up with us here at Vinemount. I like this shot very much; the clouds scudding across the sky enhance it as well as Lake Ontario in the background.